Kosuke Iwata was introduced, to substantial acclaim, in Nicolas Obregon’s debut novel Blue Light Yokohma, published last year. At that time Iwata was a Detective Inspector in Tokyo Homicide Division; with superior officers who didn’t want him and a partner who would give the world to work with someone else – actually anyone else. 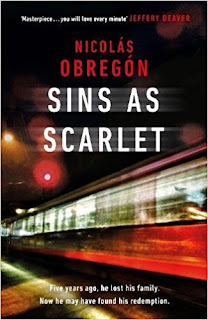 Obregon himself is British born, his father Spanish, his mother French. He grew up living in, and between, London and Madrid. He became fascinated with Japan while watching Japanese cartoons as a boy. As a travel writer he explored the country. Now he lives and works in Los Angeles. In Sins As Scarlet, Iwata has moved to Los Angeles, leaving behind his life in Tokyo. Now a private investigator doing well in the missing persons business, he spends most of his days spying on unfaithful partners, searching for the lost and the long gone, and some of his nights with a woman who can’t be his. Out of range of his past – or so it appears – Iwata is nonetheless still haunted by it, the violent deaths of his wife and child, days of hurt and rage. The LA private eye has a pedigree… Dashiel Hammett’s Sam Spade, Raymond Chandler’s Philip Marlowe, Ross Macdonald’s Lew Archer, and currently Walter Moseley’s Easy Rawlins. The genre and the movie style it spawned – christened film noir by French critic Nino Frank in 1946 – has had an astounding influence on mystery thriller writing. Nicolas Obregon has taken the baton and he runs with it brilliantly. Iwata has a love hate relationship with LA. It is his new home, but it’s also by no means the city of angels. And he works in its darkest and dirtiest places; alleys where the smell of blood mingles with decay, sweat, piss and human remains – Los Angeles was a city of new starts, of mixture, of diverse blood. But it was also a city of despair, a city that never tired of rejecting its dwellers, a city of unclaimed dead…. A town of red carpet applause and shell casings tinkling on concrete. Normal little lives ran into subplots like rain into raindrops on dirty glass. Meredith Nichol, a transgender woman is found dead by the train tracks running though Skid Row. A hate crime? Maybe, but the police don’t get much further than speculation. Meredith swiftly becomes just another lost soul and a cold case. Iwata is hired to find out who killed her. He stares at the photograph which shows Meredith’s garrotted neck – Nobody raped you, nobody stole from you, nobody beat you. But somebody wanted you dead. Was this hatred? Iwata can come up with a shed full of reasons why he shouldn’t get involved, but he is driven by the huge blanket of guilt enveloping his uneasy history. And he wades into a river of sin, running through LA’s skid row, the Arizona/Mexico borderlands, and deep within his own past. 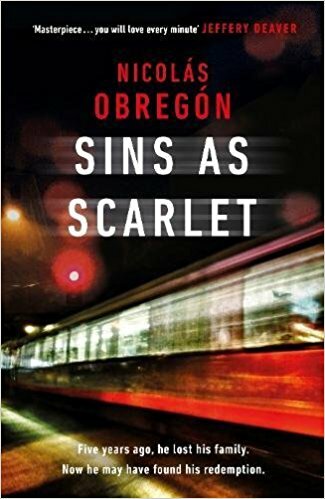 Be warned, Sins as Scarlet is a gritty and brutal ride. A savage piece of work. Tight, lean, chilling, sometimes poetic and with great nuggets of wisdom – Jeffrey Deaver has called it a ‘masterpiece’ – the story dredges up a world of evil, corruption, exploitation and murder. There is a studied violence in the writing which is fierce and explicit. It is a mesmerising read. Nicolás Obregón was born in London to a French mother and a Spanish father. He has worked as a steward at sports stadiums, a travel writer, and an editor in legal publishing. 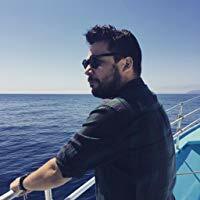 He fell in love with Japan while on assignment for a travel magazine and decided to write a novel set there while on a bullet train, two days shy of his 30th birthday. Blue Light Yokohama is his first novel and he is currently working on its follow-up. Jeff Dowson began his career working in the theatre as a playwright and a director. He moved into television, as an independent writer/producer/director. Screen credits include arts series, entertainment features, drama documentaries, drama series and TV films. 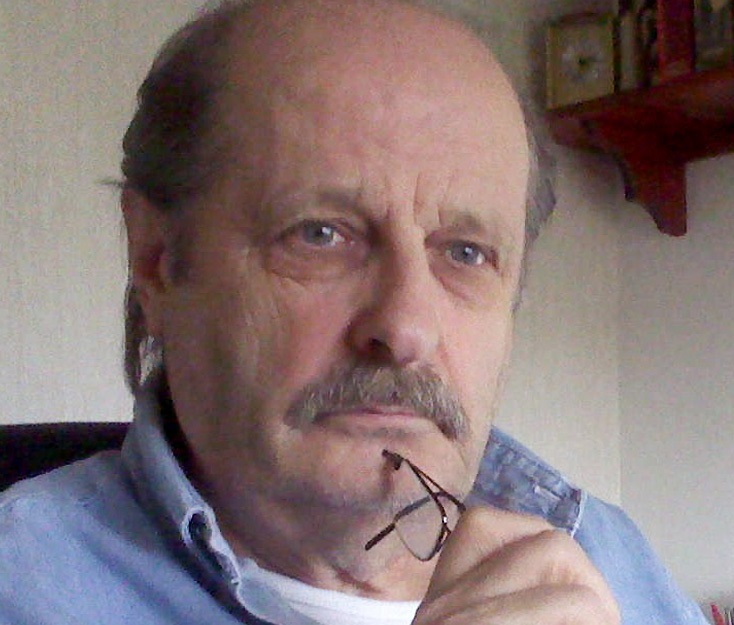 Turning crime novelist in 2014, he introduced Bristol private eye Jack Shepherd in Closing the Distance. The second thriller in the series, Changing the Odds, was published the following year, Cloning the Hate in 2017. One Fight At A Time, published in March 2018, is the first book in the American GI Ed Grover series. Born in northeast England Jeff now lives in Bristol. He is a member of BAFTA and the Crime Writers Association.